Georgia has peaches. Florida and California have their oranges, but New Jersey is blessed with the best tomatoes in the world. In fact, the tomato is so beloved in the state of New Jersey that it has been named the official state vegetable, although I hear there is a great debate going on in the legislature at the moment over whether the tomato is actually a fruit or a vegetable. Technically, I am told, it is a fruit but since the state fruit spot is already occupied by the blueberry, the legislature solved the problem by declaring the Jersey tomato a vegetable. Whatever-- personally, I wish New Jersey lawmakers would stick to dealing with property taxes and balancing the budget and leave the legumes alone. Whether fruit or vegetable, the Jersey tomato is a delectable seasonal treat, highly prized not only on its home ground, but in neighboring States and the nearby big cities of New York and Philadelphia as well. Sliced, diced, cooked, or raw the Jersey tomato makes a glutton's heart beat faster. uly and August is when the Jersey tomato is plentiful. By September, the season is pretty much over and I personally do not buy fresh tomatoes for the rest of the year. It’s not just that I am into local, sustainable, and organic produce. It is also that having tasted the best, I cannot stomach the rest. Out of season tomatoes, whether trucked in from California or Mexico of flown in from the Southern Hemisphere, are picked green, ripened artificially and often are about as tasty as cardboard. No, July and August are my months to pig out on local Jersey tomatoes. The rest of the year I am happy to do without. Oddly enough, you will not find a variety of tomato called the ”Jersey “in any seed catalog, The classic Jersey tomato is a beefsteak tomato, usually a hybrid and acquires its wondrous taste and texture from the soil and climatic conditions of central and southern New Jersey, not from its genetic inheritance. A broad range of types of tomatoes are grown in the state and there is an increasing interest, particularly on the part of organic farmers and serious gardeners in heirloom varieties. Happily, these are increasingly available in season and can be found not only at farm stands and specialty markets, but also, wonder of wonders, in supermarkets. 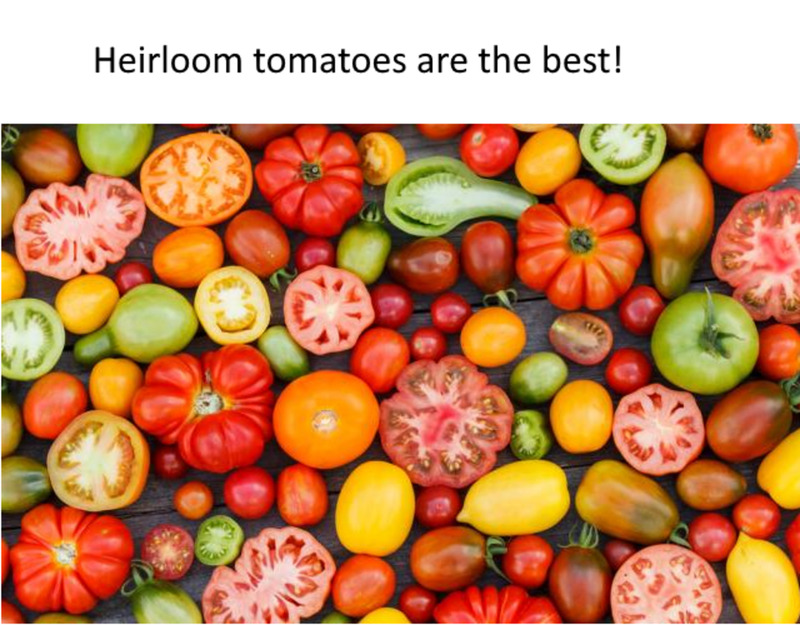 The heirlooms come in wonderful shapes and colors and are definitely tomatoes to grow in your own home garden or a pot on your patio whether or not you live in New Jersey. The tomato has a long and colorful history in New Jersey. The plant's origins lie in pre-Columbian Mexico and South America, where Spanish conquistadors tasted it and promptly took it home to Europe. It arrived in North America via England in colonial times and made its way to New Jersey in the late 18th century. Back then it was an ornamental house plant called “wolf peach” or “love apple” and was not considered edible. In fact, the fruit and leaves were thought to be poisonous. Possibly, this is because the tomato is part of the nightshade family and is distantly related not only to the tobacco plant but also to the deadly nightshade, which really is poisonous. It was thought at the time that eating a tomato would acidify the blood which would result in death. In any case, it is said that tomato history was made in New Jersey in 1820 when Colonel Robert Gibbon Johnson of Salem County introduced the tomato to local farmers in a rather colorful way. The story may or may not be true. It seems that Colonel Johnson, a local worthy, had eaten tomatoes in Europe and wanted to encourage local cultivation as a food crop. Naturally, he met with heated resistance from farmers who thought that tomatoes were poisonous and the Colonel was crazy. 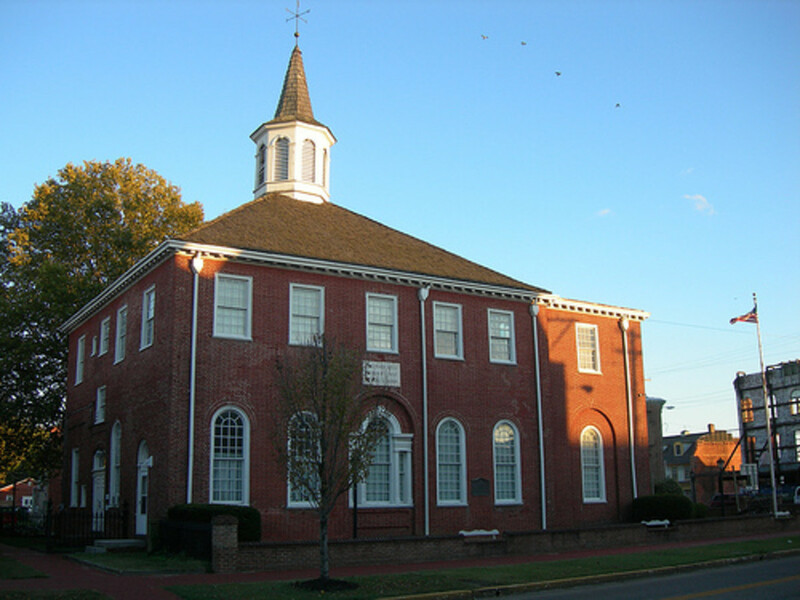 To prove to the locals that tomatoes were edible, he announced that on September 26, 1820, he would stand on the steps of the Salem County Courthouse and consume a basket of tomatoes in front of anyone who cared to come and watch him do it. Rumor has it that thousands gathered at the courthouse to watch the Colonial drop dead and were astounded when he survived. Tomato cultivation in New Jersey is said to date from this time. I have a feeling,(based on nothing but a hunch) that this apocryphal tale was told years after the fact by some clever adman on behalf of the Campbell Soup Company, which began making canned tomato soup in its Camden, New Jersey location in the 1870’s, using truckloads of Jersey tomatoes. Whether truth or fiction, the tale is a good one and probably helped make Campbell’s tomato soup a staple of the American kitchen. It’s too bad that the Jersey tomato in it’s fresh off the vine state, can only be truly appreciated by those in or near it’s native habitat and only in summer. Like a local wine, it does not travel well—nor does any tomato, which is why I eschew the supermarket, chalk-center varieties, laden with pesticides and trucked hundreds or thousands of miles to market. The rest of the world will just have to make do with their own local produce. As for me, I’m counting down to summer when the signs go up at all the local farm stands and I gorge myself on New Jersey’s state vegetable(or fruit)—whichever the legislature decides that it is. Jersey Naturals - Gourmet, foods, - New Jersey products! Specialty products and sauces made only from real Jersey Tomatoes. Order pasta sauce better than Mama's and more online. What Makes Jersey Tomatoes Special? I like tomatoes any way at all--but when they are right off the vine, here's a great,easy way to serve them. Slice two large beefsteak tomatoes and put them in a shallow bowl, Add a handful of fresh basil leaves roughly chopped up and a handful or so of crumbled goat cheese. Shake on some salt and pepper and sprinkle just a bit of finely chopped garlic over the whole thing. Now pour about a third of a cup of best quality olive oil over the whole mess and let it stand for a couple of hours. Tomatoes are the Easiest Vegetable to Grow! I am from Virginia and we also have wonderful tomatoes. Only in a certain area of the state though. They are called Hanovers. Grown in Hanover County VA. In researching why they are so special I discovered that they are grown in a region with sandy soil. They get water from a tap root when needed but the sand does not allow them to sit in water as dirt or clay would. The short explanation of this, and my paraphrase, is that the tomatoes grown in sandy soil in places like New Jersey, Hanover County,Virginia, Louisiana, Georgia, are a full flavored tomato, not a watered down tomato grown in soil that would hold water and feed the plant and its fruit/vegetable constantly instead of when needed. I don't understand why tomatoes are even served any other time of the year other than when they are at their peak and have color and taste. Definitely an expense restaurants could cut out and pass the savings on to consumers. I'm a fan of yours too now, Robie. And you are indeed correct about our Georgia duhmaders being delicious. 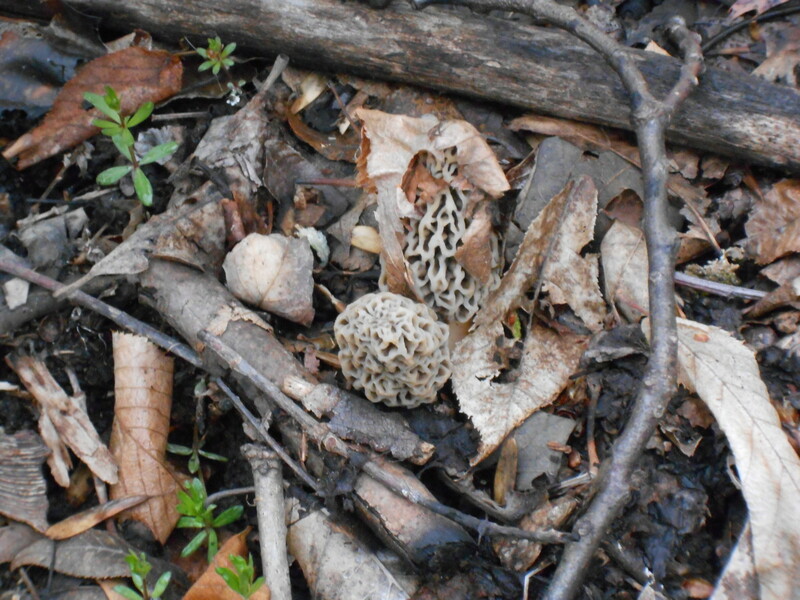 I've paid my dues picking them out in the hot sun on more than one occasion but I still enjoy them all season long. Fortunately, down here the season doesn't end until late fall as a rule. Very informative article, Robie. Some of the info I knew already but other parts is new to me. Down here in Georgia we refer to the wonderful "fruit" as "duhmaders." Well, they have some pretty terrific tomatoes up in Massachusetts as well, ElleBee--it's all good as long as it is homegrown.. We tomato lovers have to stick together. Than ks for dropping by. I never knew that they used to consider tomatoes poisonous! Looks like I was born in the righgt era, I can't imagine a tomato-less life. Grape tomatoes are my favorites, but heirloom, beefsteak etc. are good too, even though we don't get much of the "Jersey tomato" variety up here in MA. Great hub as always! 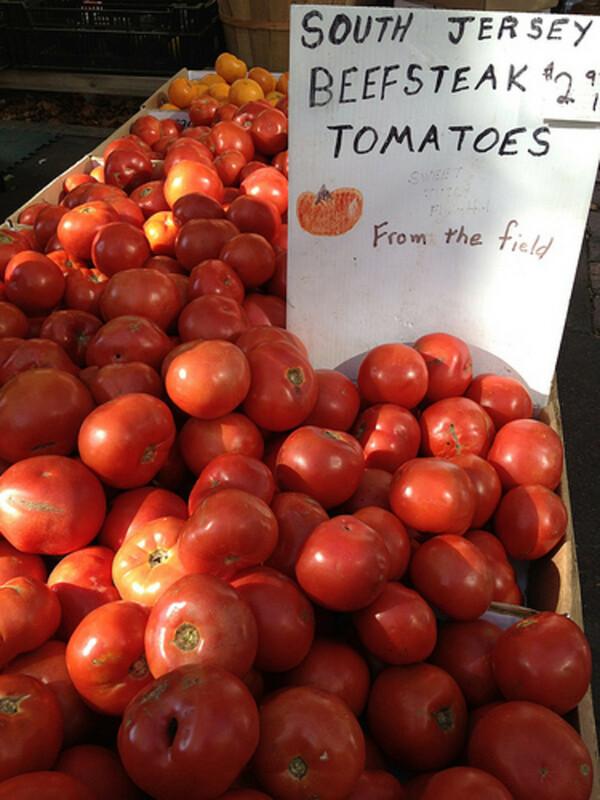 There's nothing like the taste of locally grown in season tomatoes, where-ever local is for us all! While I love NJ tomatoes, especially those selling at that regional farm stands, I'm willing to try them from other places too! Anything in season is always best when you can buy it fresh, either direct from the grower or at an area produce seller, than from any grocery store. Like you I much prefer to purchase organic & locally grown, because it tastes better, it's a healthier choice and because it keeps the money in our area too! The vegetable & flower stand at the Schneiderwind Farm location, on the PA side of the Frenchtown Bridge, gets all types of amazing Heirloom tomatoes, as does Peaceful Valley Orchards at 150 Pittstown Rd. in Pittstown NJ (that's on the way up toward Clinton). So if you're up in those areas stop by & check them out over the summer, you'll be glad you did! Loved the video with the Home Grown Tomato song! What's not to love about the tomato ... they are delicious and can be used in so many ways. A nice shout-out to the fruit or vegetable? I'm going with vegetable. Thank you so much for all the wonderful factual information you've added to this hub via your excellent, meaty comment. I especially love the backstory regarding the fruit or vegetable controversy. Jersey tomatoes ARE the best-- I've lived many places and they really do taste better and if were holding a blind taste test, I would surely let you judge it:-) thanks for stopping by. There is a tree that stands in Salem NJ which is the tree that the colonel stood under when he tomatoes in front of a mass of people that came to see him die. I don't think that it is just folk lore if they have a tree with a plaque describing the events which newspapers wrote about also. The case of the tomato being a fruit or a vegetable was taken to the highest court in the land...The US Supreme Court! They proclaimed that it is botanically a fruit and a vegetable in the culinary sense. Sounds likes one of the wisest decisions that they made in a long time! The 1863 suit was from against a New York customs collector Edward Hedden to recover duties "paid under protest" on the import of tomatoes from the West Indies. At the time, vegetables required a 10 percent tariff. Fruits were imported duty-free. In other words Nix said tomatoes were fruit (no duty) and Hedden said they're vegetables (pay me big boy)! Another interesting note is that the largest tomato tree was is the Epcot center greenhouse of Disney World in Orlando. It is recorded to have produced 32,000 tomatoes with a combined weight of 1,150 pounds! By the way, Jersey tomatoes are the best in the world but perhaps someone should have a blind taste contest next summer. I will volunteer as a judge. Robie, my wife says that I am a tomato nut, well the nut part anyway. Of the over 5,000 different types of tomatoes that exist, I have grown over 50 of them here in South Carolina. Of these 50+ my all time favorite is the Cherokee Purple, which is said to date back to the 1800’s and was grown by the Cherokee Indians of North Carolina and Tennessee. I plan to grow it again this year along with a couple of more heirloom tomatoes that I have not tried before. I found your hub when doing a search for what year the name “Beefsteak” was used for a tomato. If anyone knows I would sure like to get that information. Will be checking back later. Your hub is a great read, I could not stop until I got to the end. ·	Do not refrigerate tomatoes! They will retain their flavor and ripen correctly at room temperature. Once they are ripe, use within 3 days. ·	This vegetable is actually a berry, and is though to have come first from the Andes mountains, and the present name is close to the Indian name. It belongs to the nightshade family, along with potatoes, eggplants, peppers and tobacco. 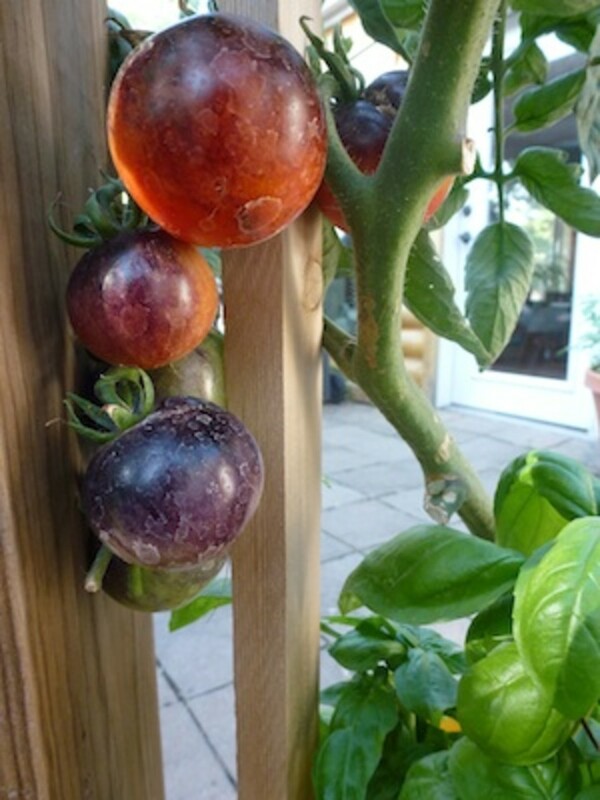 ·	In Europe, where it was taken by the Spanish, the tomato was grown only as an ornamental for many years. Eating tomatoes was considered certain to prove fatal. 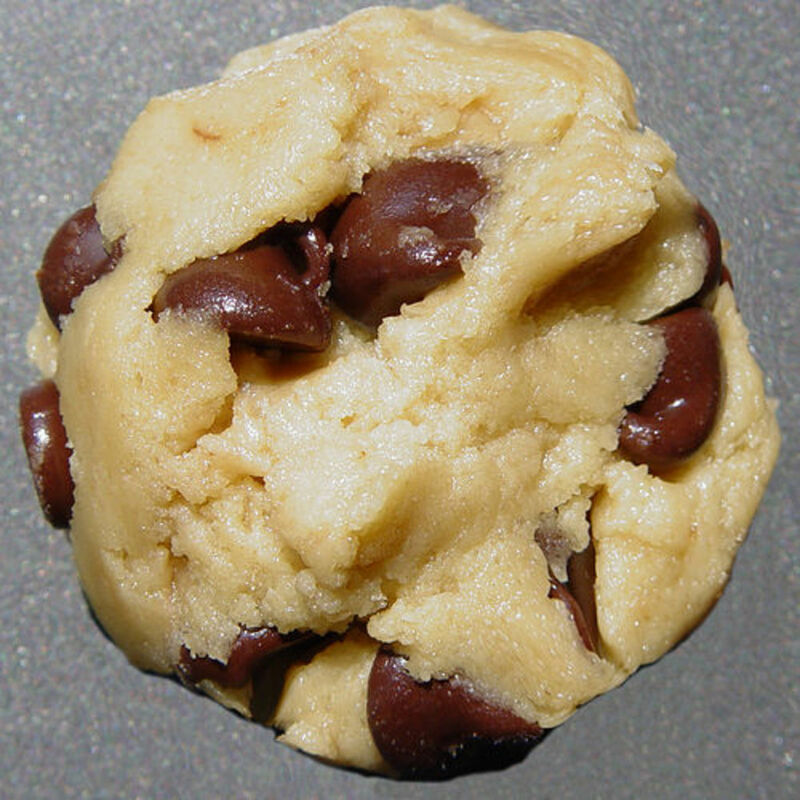 Even in North America, it has been only in the past 150 years that people mustered enough courage to try eating them. That all changed starting on the courthouse steps in Salem, New Jersey, at twelve o’clock noon on September 26, 1820, when Colonel Robert G. Johnson ate not one, but a basketful of tomatoes. He not only lived, he wasn’t a bit ill following his demonstration. Wild type tomato species are thought to be native the region of western South America and specifically in the dry coastal desert of Peru. First historical reference in Europe to the tomato was a yellow fruited type in Italy in 1544, cultivation in Germany in 1553. The Italians may have acquired it from the Turks. The tomato may have first been grown in Spain then taken to Italy where it was called "pomi d'oro" or golden apple, because of its yellow color. The French called it "poma amaris" or apple of love. The American Indians used the name "tomatl." The tomato was not very popular until the 18th century mainly because of rumors that had labeled it as a poisonous fruit. It is suggested that certain famines during this century forced people to try this plant, because by the middle of the century the tomato was much more popular. The tomato was introduced to what is now the United States (South Carolina) in 1710. By 1779 it was used in catsup in New Orleans. Thomas Jefferson grew tomatoes in Virginia in 1781. But as late as 1900 the tomato was still considered poisonous. George Washington Carver was known for standing in front of crowds and eating tomatoes, trying to introduce tomatoes into the diet. The tomato originated in South America due to the wild species found from Ecuador to Chile. This means the tomato traveled from South America to Europe before arriving in the United States. L. esculentum is probably derived from Lycopersicon pimpinellifolium which is indigenous to Peru and Ecuador. L. esculentum var. cerasiforme (cherry tomato) is considered a wild plant in the tropics and subtropics. There is also evidence that tomatoes originated in Mexico. These tomatoes show a great diversity in size and shape and include all color types known which are pink, red, and yellow. The cherry tomato is widely used in Mexico and has many Indiana names. The Nah uatl language of Mexico used the name "tomatl" which has followed the plant through Europe and South America. Mexico would be a logical origin since Cortez conquered Mexico in 1519, tomatoes could have easily found their way to Italy by 1544. There are still arguments as to the origin of the tomato. One other note, there are over 5,000 different named types of tomatoes. Robie, I loved this hub ~ and your terrific sense of humor! Wish I could try some Jersey Tomatoes. They're pretty good in the summer in parts of California, but they don't come with quite the same musical score! Thanks for a great read. Hi, Robie. I thought the former governor was the state fruit of New Jersey? (sorry, I couldn't resist.) I also am a hugh tomato fan, and only eat them when they are in season and I can get them at the local farmer's market. During the rest of the year, I don't touch them (except the cherry tomatoes, which seem to have a good flavor.) The Jersey tomato is famous, but unfortunately, I have never had the opportunity to eat one, in spite of living in N.Y.C. for 10 years. I have had a desire to taste one for a long time, but now, thanks to your tasty hub, I crave them. I loved the history too, and the story of the courthouse steps is great. Thanks for a great read! Thanks Robie2 - I found the most prolific tomato plants were the ones that came up under the shade of the trees as they were in fairly protected spots. Enjoy your T.S in N.Y.
Love your tomato tale,ajcor--and the idea of &quot;forbidden&quot; winter tomatoesLOL Maybe I'll give the compost pile trick a try. It's tomato season right now in New Jersey yum yum yum but it will all be over in a few weeks with a long winter to come:-) Thanks for reading and commenting. Australia - and we had an interesting experience this year; my son tipped the compost into the front garden on Boxing Day ( summer) and despite all the naysayers saying that we wouldn't get any tomatoes because it was too late to plant them I picked tomatoes right up until july (mid winter) - admittedly they were not very big (with many varieties sprouting) and didn't ripen in the garden as it was an ongoing fight with the frost. So once they got the merest hint of pink on them I brought them inside to ripen on the windowsill. Home grown tomatoes mid winter - and not in a glass house! Delicious and somehow forbidden because it was totally the wrong time; but tasted so much better then the Woolies jobs which certainly have many food miles on them and taste like it! thanks for your hub - I have always loved tomatoes particularly in a sandwich with freshly black ground pepper. Ahhh doghouse. Seems the tomato is botanically a fruit which leaves the New Jersey legislaturer in a pickle. Salem County New Jersey has it's claim to fame because of the tomato, but whether or not the story is true--hmmmmm. I agree with you about home grown tomatoes and I love tomato soup too--ditto sliced tomatoes on sandwiches and in salads with fresh basil--yum. So what is it exactly, a fruit or a vegetable? Such fun to hear the New Jersey Tomato History! lol I too think the best tomatoes are home grown tomatoes. I love tomato soup however. Great Hub! They also had wonderful pear and apple trees, and it was my job to pick all the fruit that had fallen to the ground, so she could make her absolutely delectable pies. Jersey tomatoes? My absolute favorite is between two slices of white bread smothered with mayonaisse, salt &amp; pepper. YUMMMMMM! There is a song called "homegrown tomatoes" -- you can probably find it on you tube...cute as it can be. I used it in a road show I wrote many years ago....the musical won best overall....by the way. LOL I always said it was that song we choreographed. I'll see if I can find it for you and give you the link. I hope whatever they were, those tomatoes were good, Eric. Thanks for stopping by. Good to see you. Brilliant! I thougth I just had some tomatos for dinner...but they weren't Jersey's so I'm not sure WHAT they were! Hi Zsuzsy--I like the idea of the great tomato debate--a virtual &quot;tomato tasting&quot;LOL and you are right, fresh, right out of the garden tomatoes are great anywhere, anytime. Yeah--tomatoes, like potatoes evidently originated with our neighbors to the south. In fact the Aztec name was Tomatle from which we get tomato. I should add one of the good history links I used in my research--infact I will. In the meantime try playing the killer tomato game I linked to. It's a hoot. Thanks, as always Zsuzsy for your comments and for coming by. Robie I loved your great hub. History too I didn't know that the tomatoe originated in Mexico and South America. LOL Robie! I love it! I grew up with an Italian Grandmother who grew tomatoes in her back yard (in NY), so they must be similar to the Jersey variety. :) Now I can't wait for summer. I was just thinking today about farmers markets and how much I miss them during the long, long , long New England winters. I love the fact that politicians are spending time debating whether a tomato is a fruit or a vegetable. Every one knows its a fruit... so what on earth are they doing... its so comical! Hi ST,pg, and John--hail the tomato. Thanks for stopping by and sharing your own tomato stories. When you think how much difference the soil makes to the taste of vegetables, it sort of changes your view of chemicals and pesticides, doesn't it? I'm more and more for local and organic when it comes to produce. If you really love tomatoes, then you need to come to Louisiana and taste the Creole tomatoe. The same ritual goes on here. People watch for the Creoles and are totally devoted to them. 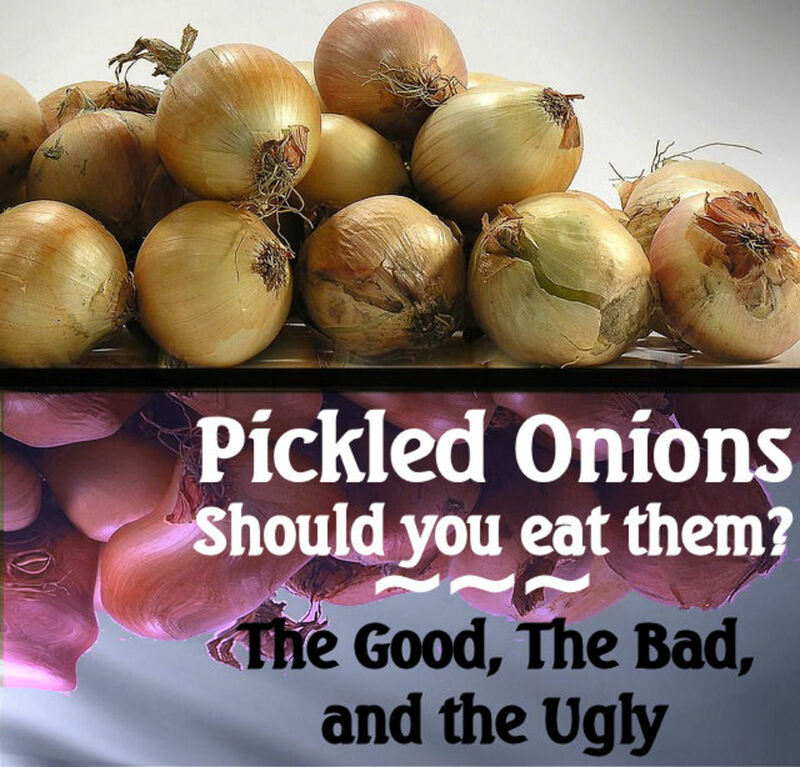 They are generally large, not symetrical but are plump, extra juicy and very delicious. It is not just the seeds. There are farmers who take the seeds and try to grow them in surrounding areas. It is not the same. The true ones come from very specific parishes (counties where you are from) and it is because of the soil deposited from the Mississippi river that gives these tomatoes a special unique and delicious taste. I would put them against any tomatoe. But I will admit to having really fallen in love with the taste of Creoles so I might be a tad biased. Mmmmmm..homegrown tomatoes! Great hub robie2! We are planting a vegetable garden this year, and I plan to try several kinds of tomatoes---never have a jersey tomato, but Indiana and Michigan tomatoes are none to shabby! The ones you get in winter, I agree--they are barely even tomatoes. As usual, another great hub! 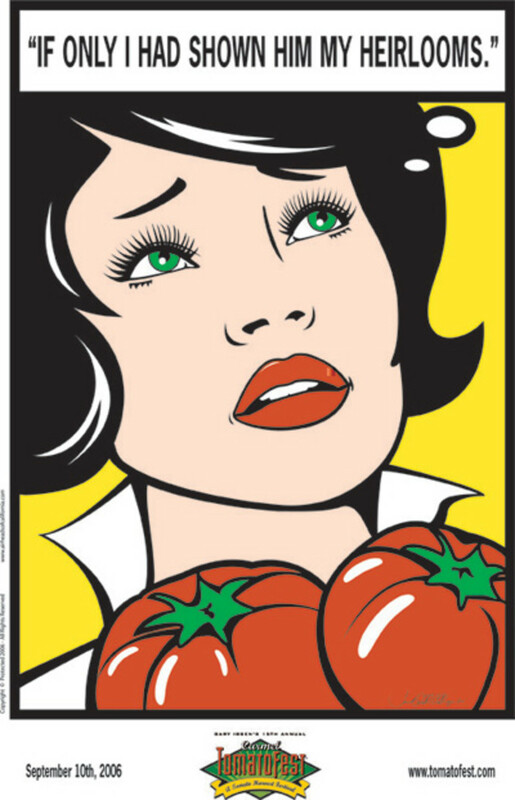 Being a Jersey girl myself, I am in total accord with you about everything you said about Jersey tomatoes. The only time they travel well is when my mother buys me a basketful, carefully places it in her car, and drives two hours to my home in Pennsylvania to make a very special delivery. My mouth is watering already.